This is one chilling book. 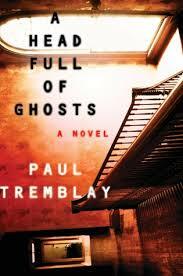 Tremblay structures the book in such a way that you are led to believe the expected climax of the book is one that will haunt you but what does haunt and linger with you after reading the last page is something else entirely. Fifteen years after her older sister Marjorie Barrett was believed to be possessed, twenty-three year old Meredith – Merry – Barrett recounts those events to a writer chronicling those events. Most of the events are recalled from a then eight year old Merry’s perspective making her the unreliable narrator of the story. With her religious father out of work and her mother unable to earn enough to prevent the loss of their home, Marjorie’s medical bills force the Barrett’s to make a tough decision. They reluctantly accept a lucrative offer to have a TV crew come in and air a reality show chronicling Marjorie’s fall into madness and eventual exorcism. This is one lean and mean scary book. Stuart Tinker who runs the Stephen King Tours and at one time owned the Betts Bookstore. Plus Hans & I discuss the latest King News. I’m back! Join me in this two year time jump as I get back into the saddle again. New site. New blog. New attitude. For posterity’s sake, my old blog posts have been migrated here. It gives you things to read until this new blog builds up some content and gives me a quick mental bookmark as to where my head was at two years ago. In the past two years, I’ve been focusing on creative writing in addition to my ongoing reviews. I am reviewing games – video and/or console – over at Canadian Online Gamers. Back to my creative writing endeavours. I’ve finished a couple of short stories, joined a couple of writing groups, and made some good connections with local writers in the Edmonton area. This fall I will be taking some writing courses to help focus on areas I need improvement on. Next weekend – August 13 -15th is the upcoming Writer’s Convention in Calgary – When Words Collide. It’s a fantastic event and great opportunity for networking with writers, publishers, and editors. Can’t wait!